Egypt's President Abdel-Fattah El-Sisi announced officially on Sunday that the head of the Armed Forces Engineering Authority, Kamel El-Wazir, will be appointed Egypt's new minister of transportation. The announcement came during the 30th cultural symposium of the Armed Forces on the occasion of Martyr's Day at Al-Manara International Conference Centre in the 5th Settlement district of New Cairo. El-Sisi said that the appointment of El-Wazir is awaiting approval by parliament, and that the new minister will be provided with all the necessary manpower, including specialists from the Armed Forces, to fulfil his duties. El-Sisi highlighted ongoing efforts to develop the ailing sector, which he said need major financing. The president said that around 102 stations have been developed, and that 32 others are undergoing development that will be competed in the upcoming year-and-a-half. Egypt has signed deals to purchase 1,300 new carriages and 200 tractors. The country has also contracted for six new air conditioned trains and 300 railway cargo carriages. 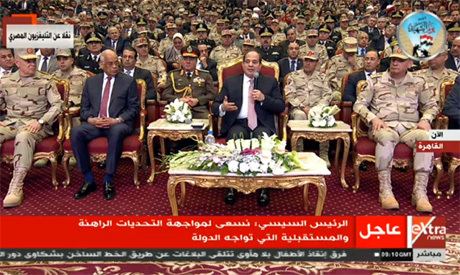 El-Sisi then urged El-Wazir to address Egyptians with a few words. El-Wazir responded, saying: "We will work on developing all sectors of the transportation ministry. We will prove to all Egyptians that their country has strong leadership with political awareness." "My colleagues and I are ready to work constantly to develop this sector," the newly appointed minister added. El-Wazir's appointment comes nearly two weeks after his predecessor Hisham Arafat resigned following a deadly train crash in Cairo's Ramses station. El-Sisi also promoted the newly appointed minister, who is also an army officer, to the rank of lieutenant general. Referring to the deadly incident, El-Sisi said, "The new civil service law we have been working on aims to regulate the situation," adding that anyone in the transportation sector proven to be taking drugs "will be immediately dismissed." "All drivers will undergo medical checks, not only in the railway sector but in all other sectors," El-Sisi said. The president explained that officials have been planning projects in the sector worth EGP 4 trillion, due to be ready by 30 June 2020. Prime Minister Mostafa Madbouly, Minister of Defence and Military Production Mohamed Zaki, House of Representatives Speaker Ali Abdel-Aal and a number of ministers and senior state officials attended the symposium on Sunday. Every year, the Armed Forces celebrate Veteran Warrior and Martyrs' Day on 9 March, marking the anniversary of the death of Lieutenant General Abdel-Moneim Riad, who, along with several of his aides, were targeted by an Israeli mortar attack in 1969 during the War of Attrition (1967-1970) with Israel.